← What’s been happening to our weather? 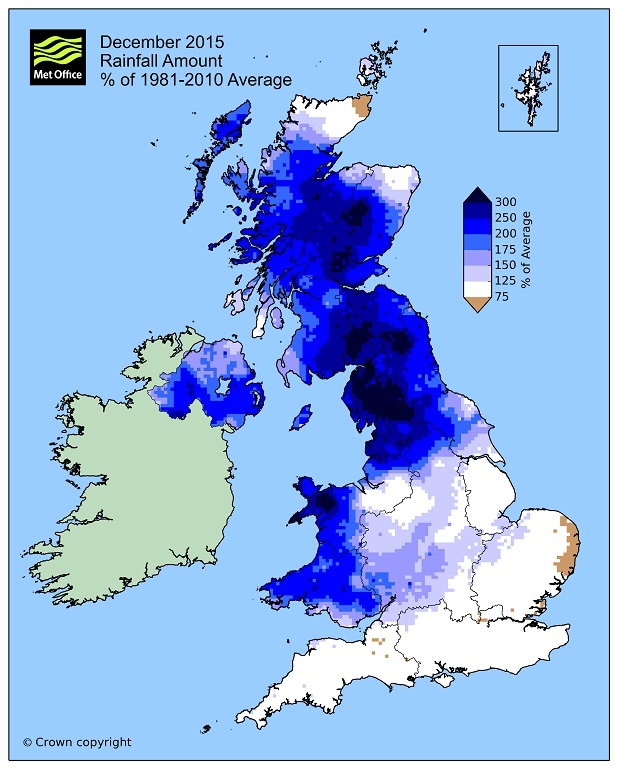 December 2015 was the wettest calendar month for the UK in a series of monthly weather records stretching back to 1910. But why does the Met Office state 1910 when listing records, especially when some records existed well before that time? Part of the answer is that the Met Office has a responsibility to collate weather records for the entire UK, the UK countries and historic counties. The digital archive used to generate our UK analyses includes station observations back to 1853, but only since 1910 has there been a sufficiently dense network of stations to allow an analysis of the whole UK. One station, the Oxford Radcliffe Observatory, which is managed by Oxford University School of Geography and the Environment – holds rainfall records back to 1767. This allows a greater understanding of the rainfall in Oxfordshire, but doesn’t allow greater comparison with England or the UK: vital when you are trying to provide a complete picture. The England and Wales Precipitation (EWP) series stretches back to 1766. In recent times the EWP – a highly significant climate series – is based on records from around 100 stations, but the further you go back the fewer recording stations there were. This provides a good analysis of records for England and Wales, but doesn’t capture the remainder of the UK: Scotland and Northern Ireland. Additionally, it doesn’t take account of the thousands of recording stations which provide more detailed picture for the UK in more modern times. Dr Mark McCarthy is the head of the Met Office’s National Climate Information Centre. Commenting on the results he said: “Although our UK dataset currently only stretches back to 1910 we are adding to it by digitising more of our extensive paper archives in order to extend these records further back in time. When we have done that it is possible that months like October 1903 may rival or even surpass some of the UK records set in December 2015. Met Office national records are created using a method to interpolate observations from our network of stations onto a 5km by 5km grid covering the UK. The gridding method is a more sophisticated approach for analysing rainfall than simply taking an average of station data. However, because it also requires a denser network of stations it is not as long running a series as the EWP and some long running observing sites. The different datasets are therefore complementary and we use both to monitor our changing climate. So, the UK’s national climate series – the records you will see quoted when the Met Office routinely releases statistics – is a comprehensive rainfall analysis covering the whole of the UK back to 1910 using all available observations. Other series including the EWP are also a vital part of our national climate monitoring and provide us with an even longer historical context for some parts of the UK. Professor Adam Scaife is a climate scientist with the Met Office’s Hadley Centre. He said: “It’s clear that December 2015 was a very significant month for rainfall and was the highest since our records began in 1910. We have been asked about the link between climate change and the rainfall in December 2015. This entry was posted in Met Office News and tagged Central England Temperature, climate change, England, England and Wales precipitaion series, Environment Agency, flood, flooding, forecast, global warming, heavy rain, Met Office, Met Office Hadley Centre, rain, rainfall, record, Scotland, statistics, UK, wet. Bookmark the permalink. More of the usual spin and obfuscation from the Met Office. Whether or not the records before 1910 are digitised or not, if the older records going back to 1766 show higher rainfall totals for the month of December than 2015 in the England and Wales series, then it is clearly dishonest not to disclose that fact, however inconvenient. This is just one more example of the politicised Met Office using selective information to pursue their CAGW agenda. All this is doing in reality is further eroding any credibility the organisation has left. I’m reminded of a similar project to digitise weather records that I encountered in 1965 when I was posted to the Marine Division at Bracknell. There, they were processing weather and oceanographic records from ships’ log books, many of which were from Victorian times. It seems odd to me that this was being done for ships records fifty years ago but that UK land records are still incomplete. It likely proceeds slowly because its labour intensive which makes it costly. I read that in the US they made prisoners do it! It may indeed look odd to any reasonable person, but when the older records are inconvenient for making claims of ‘extreme’ weather based on much shorter more recent datasets, it’s not too difficult to see why this is not likely to be a priority to the Met Office. It’s just one of the reasons why this quango needs a clear-out of management. LOL dear old Christopher doesn’t know the difference between the UK and England and Wales! The Met Office is behaving outrageously, but with typical establishment spin, to make claims about records since 1910 when it knows that longer term records exist which contradict the story line. You can bet that when (if?) the older records are looked at the Met Office will not issue a correction press notice with the same gusto as they did their original claim. One wonders if the senior staff at the Met Office have a clause in their bonus arrangement to the effect that any spin that supports Global Warming gets a tick and anything to the contrary gets a big fat cross. ukiplocal is behaving outrageously by suggesting there is a longer term record – it doesn’t exist! What the Met Office have produced is an estimate for the UK area average – not a trivial task given a finite number of stations, and not possible to the desired accuracy from the earlier station data. So while there are earlier data, there is not an earlier record. Its not the same thing at all. You could make a longer record using sparser data, but it would not be a very good – the error bars on the UK average would become unacceptable as you go back in time. You would likely end up having no idea whether there were wetter years earlier on because the uncertainty in the estimates for those years would be larger than any differences. What would be the point of that? Thanks for bringing your politics to a science discussion btw. Not.